An acute wry neck or ‘stiff neck’ is a common complaint which will probably affect everyone at some point in their life. Symptoms include sudden onset neck pain with restricted movement. It is, however, usually short-lived, lasting for just a few days at a time. Symptoms of a stiff neck or acute wry neck include sudden onset neck pain with restricted movement and stiffness. The patient may have woken up with the symptoms or moved the head suddenly and felt a sudden pain in the neck. They will have a tight, stiff feeling in the neck and surrounding muscles and have great difficulty moving the neck, especially turning the head to the side. The patient may have deformity as the neck muscle tighten up or go into a protective spasm. Some patients may experience headaches and/or have pain radiating down into the upper back or arms. A professional therapist will do a full examination taking patient history to try and identify the immediate cause of symptoms, as well as potential longer-term causes which may have lead to the injury. The cause of an acute wry neck is often from a sharp movement of the head which brings on symptoms suddenly, or perhaps the patient may simply have woken up with neck pain. More often than not a wry neck or stiff neck is caused by tight neck muscles which may have occurred over time from poor posture or repetitive strain. Working at a desk using a mouse causes constant tension in neck, shoulder and arm muscles. If the muscle cannot relax then blood is not pumped through the muscles and eventually, it weakens and goes into spasm to protect itself. Then a sudden movement causes a minor strain in the muscle which in turn tightens up resulting in neck pain, restricted movement, and deformity. 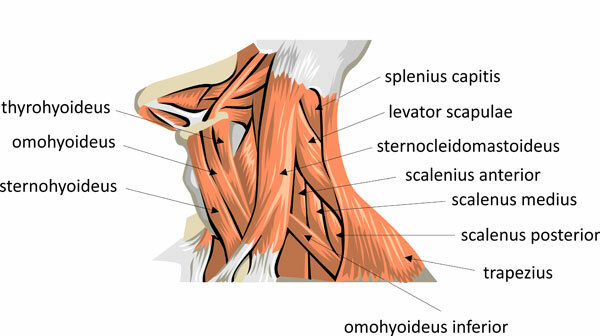 The levator scapulae muscle is a common cause of neck pain and stiffness. Poor posture, repetitive neck movements, unusual neck positions (especially when sleeping), stress, sports activities or lifting weights can increase the likelihood of suffering from this. 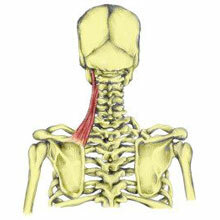 One theory of the cause of an acute wry neck is the zygapophysial joint in the neck. If this is suspected as the origin of symptoms then pain will be felt over the zygapophysial joint itself or spinus process at the back of the neck. A stiff neck can occasionally be a symptom of another condition, such as meningitis, although this would feature other symptoms such as temperature, nausea or vomiting. Neck injuries and problems with the vertebrae or discs may cause a stiff neck due to muscle spasms which naturally attempt to protect the injury. Always seek professional advice if you are unsure about neck pain. Although very rare, antlanto-axial rotary fixation should not be missed. 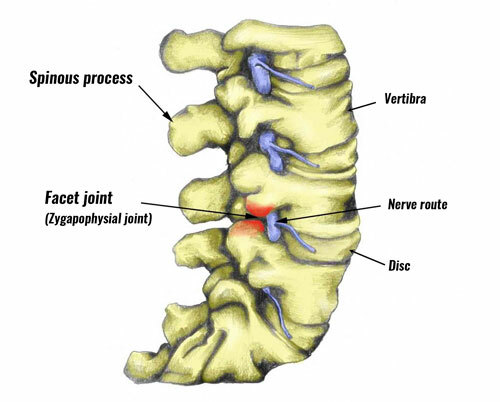 This is a partial rotational dislocation (subluxation) of the C1 vertibra over the C2 vertibra in the spine. It is mostly seen in young children and can occur spontaneously, or be related to other conditions such as congenital (hereditary) problems of the upper spine, or juvenile onset rheumatoid arthritis. It may also be caused by trauma. Medical imaging is done to confirm the diagnosis. Treatment for a stiff neck is to manage painful symptoms and improve the condition of the muscles through massage and exercises. If the source of pain is thought to be zygapophysial joint or disc related then manipulation and mobilization are not recommended. Rest is essential to cure a stiff neck. Avoid any activity that may have caused it or increases pain. Often if a neck strain has occurred the pain is so severe in the early stages that movement will not be possible anyway. For the sudden onset of acute neck pain where a muscle strain is suspected to apply ice or cold therapy for the first 24 hours. Do not apply ice directly to the skin but use a wet tea towel or use a commercially available cold therapy wrap to avoid skin burns. After the first 24 to 48 hours following a suspected muscle strain, applying heat may be more beneficial. Heat will relax the muscles and encourage blood flow. If the muscle is relaxed and blood is flowing through the muscle then it can get the nutrients it needs to heal and function properly. Try and identify possible causes which may lead up to sustaining a stiff neck. These are often postural or work-related and develop gradually over time. Read more on preventing back and neck pain. A professional therapist or doctor can assess neck pain and identify potential causes. They may prescribe pain medication or NSAID’s such as ibuprofen. Always check with a doctor before taking medication. ibuprofen should not be taken if you have asthma. A professional therapist may use electrotherapy such as ultrasound to relieve symptoms. Ultrasound passes high-frequency sound waves into the tissues and has a pain relieving and micro-massage effect. Massage may be beneficial for treating neck pain. Sports massage should not be applied immediately following a suspected muscle injury as it may make it worse by increasing bleeding and preventing the healing process taking place. However, once the initial acute period has passed (24 to 48 hours) then gentle massage initially, progressing to deep tissue massage may help relieve pain, increase mobility and improve muscle condition. Gently stretching the neck muscles if pain allows can increase mobility and reduce pain over the long term. Neck rotation stretch – Stretching the neck from side to side like this can help ease neck aches, especially if you apply gentle overpressure with your hand. Start facing straight forwards and with your arms in front of you. Keep the elbows straight and clasp your hands together to stop your shoulders from elevating. Turn your neck so that your chin moves towards your shoulder. Hold for between 10 and 30 seconds. This can be varied when twisting the head, by lifting the chin slightly upwards to place more emphasis on Sternocleidomastoid at the front of the neck. Lateral neck flexion stretch targets the upper trapezius muscle. This stretch can be very useful for people who suffer from tight, aching muscles in the upper back and neck, such as those who work at a computer. Look straight forward and do not let the chin drop down. Move your ear towards the shoulder but do not let your shoulder lift up. Hold for between 10 and 30 seconds. Increase the stretch by using the left hand to apply gentle pressure to the right side of the head. Roche CJ, O’Malley M, Dorgan JC et al. A pictorial review of atlanto-axial rotatory fixation: key points for the radiologist. Clin Radiol 2001;56(12):947–58.